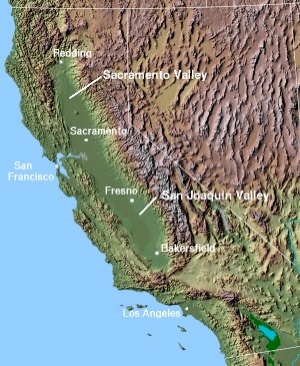 Nestled between the Pacific Range mountains to the West, and the Nevada Range mountains to the East, lies the San Joaquin Valley―one of the most fertile agricultural areas in the world, as shown in this map. It extends between Redding to the north and Bakersfield to the south. It has been called the breadbasket of the world, and for good reason. This region produces food that feeds the nation, indeed the world: grains, fruits, vegetables, nuts, rice, beef, milk, and more. 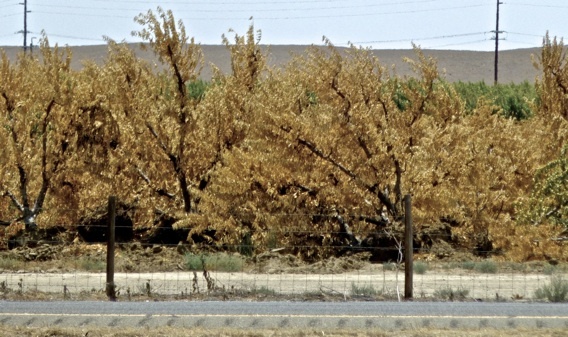 This is a photo of a dead orchard along I-5 in the San Joaquin Valley. The trees died for lack of water, then were uprooted and laid on their side by the farmer, perhaps to make a point, or perhaps in preparation for selling the wood for whatever he could get. This is changing, and very rapidly. Because of a minor and non-essential variant of smelt, called the Delta Smelt, water has been reduced over a large part of the Valley and could be shut off altogether. This not only destroys families, businesses, jobs, communities, local economies, and government services, it makes Americans dependent on foreign food sources, food that is of questionable quality. In the midst of this crisis, the federal and state governments continue their campaign to destroy dams, and with them, the reservoirs that were built to provide water in summertime. The loss of those reservoirs, actually man-made lakes, will result in the return of flooding in the springtime and draught in summertime, and the loss of habitat and recreational areas. As the illogic and even intentionally falsified “science” behind these actions continue to persist, it becomes increasingly apparent there is an agenda that is destructive to the prosperity and sovereignty of our nation, and that the primary danger to our national future comes from within, not from without.